It is an extremely busy time right now at Singlemalting land and I apologize for getting slightly behind in the blogging stakes. I will be making up for it in December as I will be blogging from the 1st every day right through till Christmas Day. I’ll reveal more about that in coming weeks. The secret is out on today’s whisky as the small and unobtrusive Tasmania Distillery stepped up to slay giants this year winning the coveted World Whisky Awards best whisky for 2014. I am lucky enough to have a very early version of what eventually became a world winning dram. On one of Patrick Maguire’s trips to Canada he had with him a bottling of what was then known as the Port Maturation Cask Strength which usually ran at 60%. This bottle however had a little sticker over the 60 and had 47% in its place. 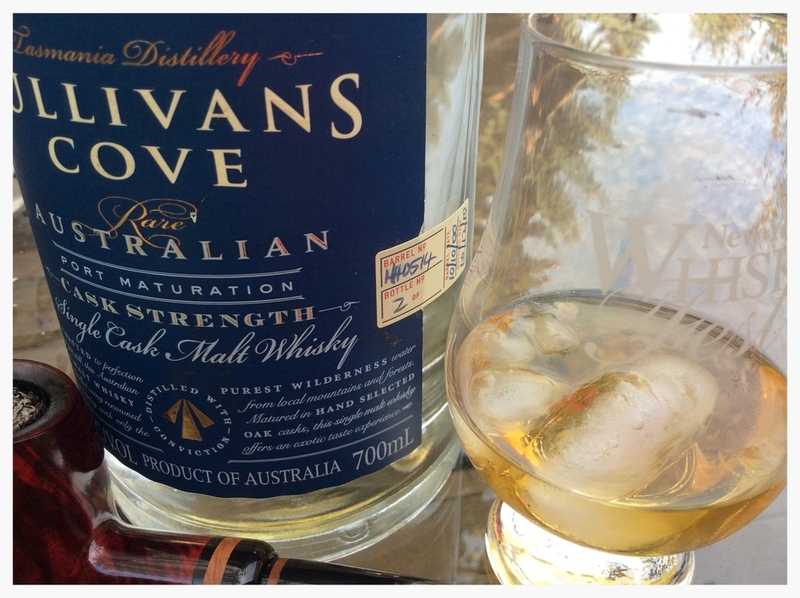 This ABV became the new norm for the Tasmania Distillery Single Cask Program and what a difference 13% can make. This is one delicious whisky. Lovingly hand crafted from 100% Tasmanian grown Barley and distilled using pristine water – Tasmania is really gorgeous and quite often the forgotten destination when traveling down-under. Sadly there was only a meager portion left in the bottom which I have kept hidden away in my basement until today when the balmy Autumn evening and the deck called to me. It is long overdue to drink this last dram and a half and now that it is the best whisky in the world, I feel even more special sitting here tasting this first rendition of the 47% version. I just had to add a cube as it could be my last hurrah on the deck this year with a balmy 24 degrees holding sway on this late September evening. The Nose: All soft sweet fruit like a stroll past the fruit cart on a Saturday morning at the Salamanca Markets in Hobart. Passion fruit and ripe mandarin with wisps of rock melon and ice cream (one of my childhood favorite desserts). The Taste: Tropical fruit smoothie topped with a dark chocolate wafer. This is some seriously yummy whisky. Sorry for the short note but I got so carried away that I finished it off before I could add more and now its all gone 🙂 I’m sure that professional bloggers never have this happen. Wow Patrick hit this over the pavilion for 6 (Aussie cricket reference). So fantastic to see such a small distillery in a non-traditional whisky country such as Australia make something this amazing. Believe me when I tell you that Patrick’s road has been long and hard to get to this point. 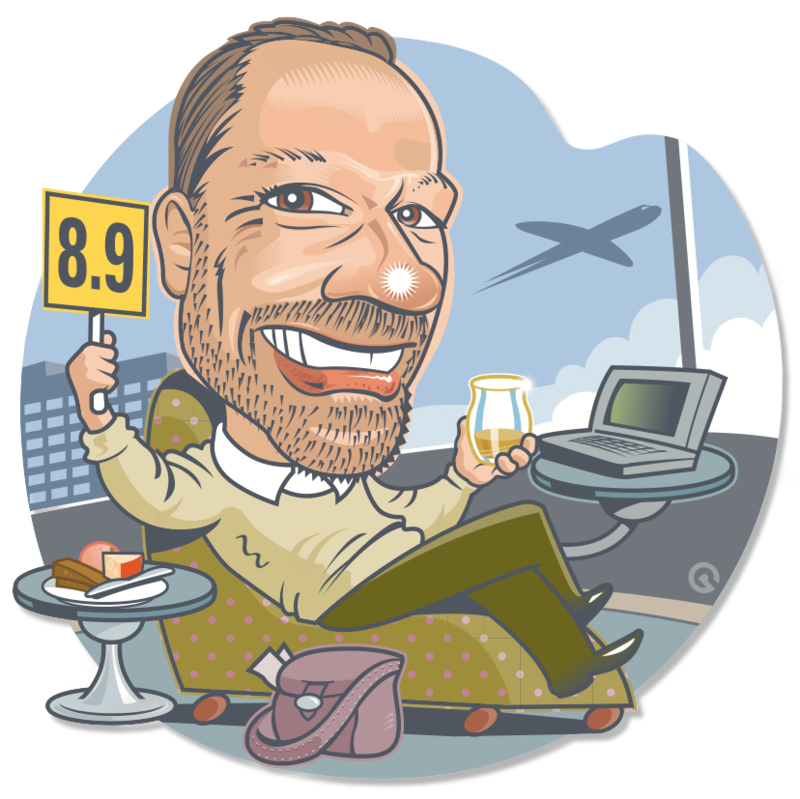 Only a driving passion for excellence and his attention to detail have paved the way for the heady accolades that have come so deservingly. I now get phone calls and emails from all over the world including from Aussies back home trying to buy a bottle from the store shelves in Alberta Canada, such is the demand for this whisky. I even pulled out the Lorenzetti and stuffed it with the Brigham Ripley Avenue which was an absolute delight as a pairing with its soft vanilla Christmas spice character. If you are looking for a bottle of this now very rare whisky, we are bringing in a small amount to Alberta this Christmas, so feel free to pester me so that I can point you in the right direction to those few retailers that will be on my “nice” list this year – naughty retailers need not apply. Next week is a special blog foretelling a new company, new distillery and new adventure for an industry giant wrapped around a bottle of “spring water” that I received in the mail a few weeks ago. Until then, have yourselves a fabulous fall evening on the deck with your favorite dram and a nice cigar or pipe. Did I say 40% whiskies?? Well while I was rummaging through my collection of all things yummy, a very cold wind blew in from the Rockies and darn if I didn’t have to light the fireplace and think about snuggling up on the couch with my wife and the dog and sipping on something delicious. Looking through my collection just about one of the yummiest drinks at 40% that I love to indulge myself in regularly is Cognac. Not just any Cognac mind you but something from a smaller producer that truly cares about exceptional quality and balance. Drouet is one of those producers. A family owned distillery for over 4 generations Drouet is in the heart of Grande Champagne country and as a result all their Cognacs from their VSOP to the Paradis are 100% Grande Champagne. 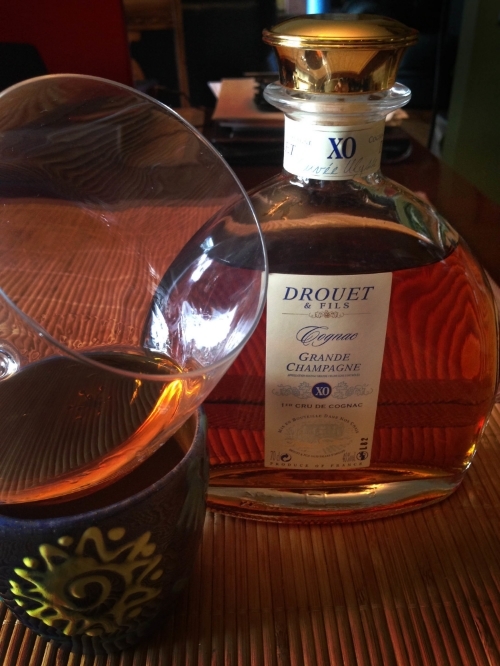 With my thoughts turning to Cognac it is time to break out the brandy snifter and the steaming mug of water…….Sorry cant wait, allow me a few minutes to get said Cognac ready before I get back to chatting with you……………………………….. Using the snifter one has to be very gentle in the approach as even 40% can become something akin to full blown cask strength. OK water boiled snifter polished and Drouet XO poured freely. Even after just a few minutes resting in the tilted snifter atop one of our favorite coffee mugs, picked up from a local clay potter in Barbados, the XO is fairly bursting out of the top with amazing aromas. It’s incredible the nose on this cognac at 40%. Using the snifter one has to be very gentle in the approach as even 40% can become something akin to full blown cask strength. Doing a quick drive-by my wife Cindy stuck her nose into the glass and came up with stewed plums covered in toasted marshmallow…wow. For me I got a lovely slice of fresh toast with creamy butter and Seville orange marmalade. After 5 minutes the Cognac is starting to warm a little and on the palate is absolutely gorgeous. Soft candied oranges with hints of dried fig and cinnamon. At about the 8 minute mark the steam lessens and the Cognac starts to cool a little. As it cools the finish becomes decidedly drier with a long lingering finish that develops some lovely spicy character. Cloves and soft white pepper splashes. Warming me up from the inside out this is a great way to spend a chilly late Summer/Fall afternoon in Alberta. This is a delicate and extremely complex Cognac. At 40% it is absolutely perfect. More alcohol would overpower the delicate nature of this lovely spirit. A lot of the time 40% as an alcohol percentage represents the lowest point that a spirit can be legally created. This means the maximum amount of volume/production and many including a fair number of Single Malts suffer flavor and complexity due to the demand for quantity. In this case however much like some amazing low alcohol wines 40% just sits perfectly. I will work on scrounging up some 40% whiskies at some point but for now hoping that Indian Summer kicks in for the remainder of September in Calgary I’ll crank up the fire and relax while I finish off this delicious XO. It’s a tough job this blogging and I’m glad that the burden has fallen to me to bring you something interesting each week. Until then, grab your Brandy snifter, boil your water and try on a Grande Champagne Cognac. I promise you wont be dissapointed.